Samepage is a "contextual engagement platform" that just launched some new features (see press release below). It has a free version with some great features, including context and collaboration, organizational features, and communication. There are more advanced features available for a fee. It has an intuitive, well designed, user interface and it only takes minutes to get started. Samepage allows users to create content, including text, multimedia, Office Files, PDFs, Dropbox files, attachments, Google Drive, Google Maps and more. Users collaborate in real time and can comment and work together on projects. It can be used by people for personal projects and planning as well as by companies and groups for major projects. It's very easy to use and setup and can be very useful for managing events, trips, projects, and much more. It is web based and there are mobile apps available for iOS and Android. You can create "Pages" that are private, social on Facebook, Twitter and LinkedIn, Group pages, and Public Pages for anyone. STARTUP GRIND 2015 GLOBAL CONFERENCE ­ REDWOOD CITY, CA ­ FEBRUARY 9, 2015 ­ Samepage, the free online place where people can communicate and share content with context, today announces significant platform upgrades including a fresh modern design, mobile apps for iOS and Android as well as a range of innovative features, further strengthening its consumer and business offerings. Samepage now enables easy inclusion of content from cloud based services such as Google Apps, Dropbox, Google Drive, Microsoft OneDrive and Box and includes social page sharing via Facebook, Twitter and LinkedIn. "Our vision at Samepage is to create an online place where people can easily share ideas, content and context” says Scott Schreiman, chief executive officer of Samepage and Kerio Technologies, the parent company to Samepage. “ We've based the development of Samepage on three fundamental principles, first the need to bring together files with conversation to preserve context and help people get more done. Second, the need to support a 'post-file' world via integration with top cloud services and finally, ease of use to bring these benefits to consumers as well as businesses." With fast-paced lives and an overwhelming number of ways to connect with one another, communication and collaboration have become increasingly challenging. 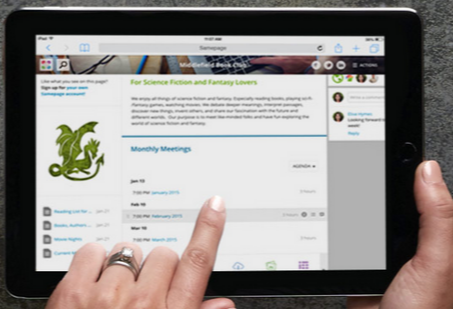 Samepage’s new features enable people to easily organize ideas and communicate with each other to get more done. Samepage differentiates itself from other collaboration solutions by offering contextualization to all content featured on a page. People are empowered to define, share and preserve context related to specific pieces of content on a page streamlining the collaborative process. No more hunting for old emails or getting lost in a cloud file folder. Samepage for Business is a paid service that businesses can rely on to improve productivity while reducing email volume. For more details, go towww.samepage.io/business.